Have you ever wanted more than just butter? How about some blue cheese at the same time? 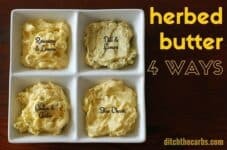 Herbed butters 4 ways are the perfect and easy solution to have it all. 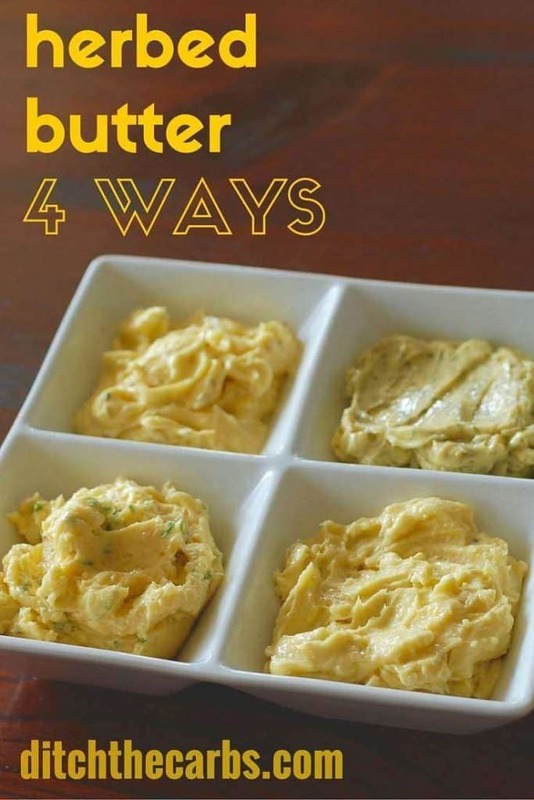 Read on and see my favourite ways to use herbed butter 4 ways (no.3 is my favourite). Herbed butter is incredibly versatile, and don’t let anyone fool you that it’s difficult to make – easy peasy. Zero cooking skills required. Yet they look incredibly beautiful to serve. Guests can pick their favourite herb or flavouring, children can lavish herbed butter on their vegetables (so can adults) and watch them empty their plates as quick as a flash. When readers ask me how to encourage their children to eat their veggies, I always reply with a healthy fat such as butter, cheese or mayo and olive oil on salads. Who wants dry vegetables or a dry salad? Not me and certainly not my kiddies. And to serve vegetables wth healthy fats, allows us absorb all those amazing fat soluble vitamins A, D, E and K.
Now we talk steaks – nothing, absolutely nothing, beats a beautifully cooked steak with blue cheese (IMHO). 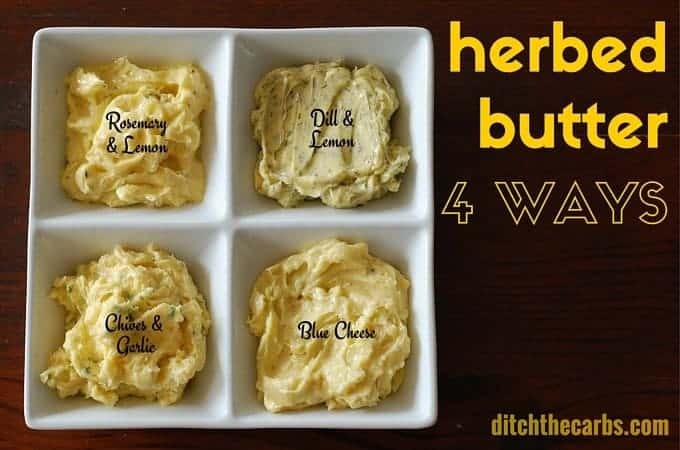 So if you’re hosting a summer BBQ or a winter steak night, offer these herbed butters 4 ways. In fact, if you like a salmon steak, the dill and lemon is the perfect match. Perhaps the rosemary and lemon would be fabulous on a lamb steak and garlic and chives on some vegetable kebabs. 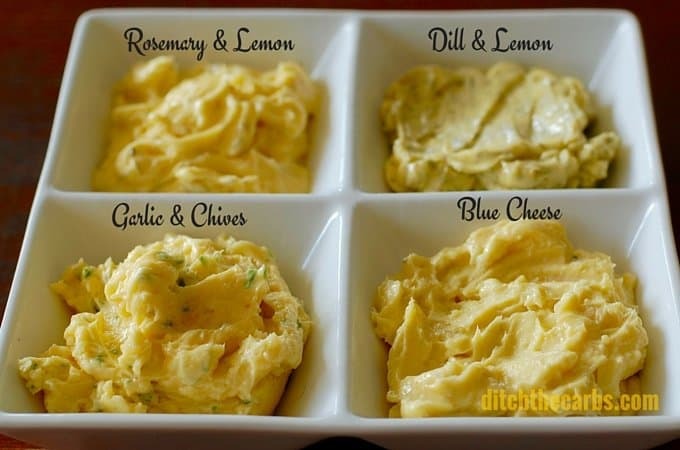 The best thing about herbed butter 4 ways? They can be frozen in ice cube trays for individual servings. 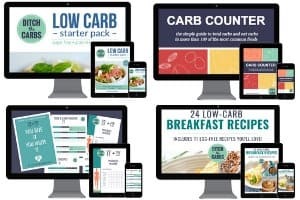 It never says the recipes are vegetarian – just carb conscious and gluten free. Who doesn’t love herbed butter😍 And indeed it really works with everything!